Blog to Facebook / Twitter Integration – Flawed, Cracked… But Rare! Today, I spent a few hours creating Facebook pages for my blogs and then integrating them with the blogs so that I don’t have to update each post separately on Twitter and Facebook. It may sound simple but was quite a monumental task. But, thanks to NetworkedBlogs, the task was made relatively easy. If anyone wants to integrate their blogs with Facebook and Twitter, here is a rough idea on how to do it. A Twitter account (optional) – You can create one at www.twitter.com and tweet away all you can in 140 character glory. Once you have all of the above, you would at first need to create a page on Facebook for your blog. On the Create Page section. Select the Brand or Product option and from the dropdown list select Website. You could enter what kind of blog or the name of your blog in the area provided below. Here is a link that explains it all with screenshots: How to create a Facebook Page? Well, Facebook considers your blog to be a business. After this comes the part of linking this page to your blog so that every time you update your blog, this Facebook page automatically updates itself. And that is where we require the help of our NetworkedBlogs account. This might be possible in other ways. Before Facebook got meaner and leaner, there was a way you could import your blog activity to the Notes section. But that no longer works. Because Facebook loves you! Their posts on your FB timeline look pretty with a thumbnail preview of your blog or one of the pics in your post. You can find blogs of your Facebook friends and connect to them and they can find you. There is a Quick Publisher which helps you re-post any of your blog posts to Facebook or Twitter or whatever other social network you have linked to. You can vote posts up to keep them in circulation. This works for your own posts as well as those of blogs you follow. **If you are keen on increasing hits on your blog then it is better to middle-click or context-click / right-click and Open link in new tab on the post heading that shows up in the Panorama feed. This will open your post in the original blog. If you just left-click / normal-click on the post then it opens in an iFrame within NetworkedBlogs, which would mean no traffic gets generated in your blog. One other con I have had to face is that for both my blogs it imported only the latest 25 posts. I do not know if it is a limitation set on a free account or you need to upgrade to premium to import all your posts dating back to when you started the blog. I am also not sure if it is a technical limitation. After you register the blog it asks to verify if you are the blog author as I mentioned earlier. 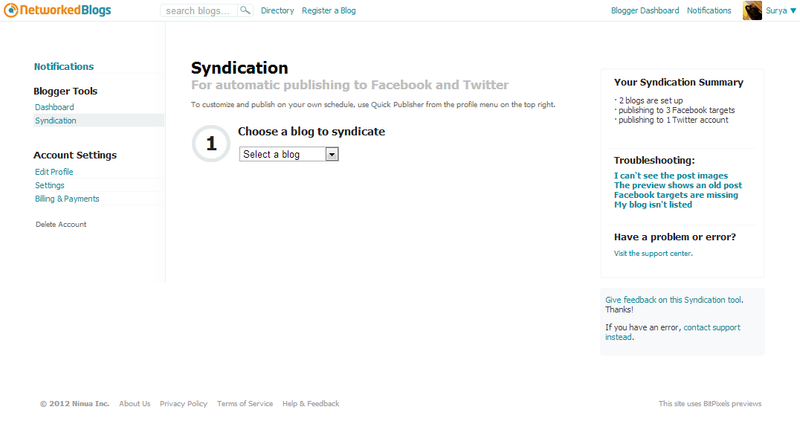 Then it is time for syndication… this is how you link Facebook and/or Twitter with your blog. As I have already registered and syndicated both my blogs, I could not generate screenshots for later posts. But it is intuitive and you shouldn’t have any issues. When you add Facebook and Twitter for syndication, you will be asked to make a test post (by clicking a link). This test post is published temporarily on your blog and if the syndication has been successful it would result in the post showing up in your Facebook & Twitter timelines / feeds. So, you might want to delete the post from your FB and Twitter feeds manually… they are automatically deleted from your blog. You would find some videos around for the same, but I found most of them, if not all, use the old Facebook and NetworkedBlogs layout. Also, it seems older women are experts in the blogging business… most of the videos are by them. On a different note, I downloaded Windows Live Writer for my PC. It is part of Windows Live Essentials. This program is a heaven-sent for bloggers. You have to try it out to know how wonderful it is. It is way better than posting directly from Blogger or WordPress. It is a WYSIWYG platform with the intuitiveness of MS Office. Again, I am enjoying my first impressions… this is my first post with the program, totally written off the browser. Thanks, Nawaab saheb for letting me know about it. And I understand why you have installed Windows on a virtual machine on your Mac just for this program. It IS that good.